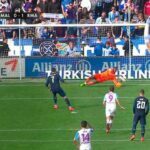 Sarah Arcand was in attendance at Real Madrid’s 4–0 win over Sevilla and happened to be sitting right behind the goal Cristiano Ronaldo was aiming for as he lined up a penalty. Naturally, she took out her phone to film her great perspective of this moment, but what she didn’t know was that she would end up being the star of her own film as Cristiano missed the goal and hit her eye instead. Lucky enough to visit from canada and see Real Madrid vs Sevilla. Not sure that Cristiano Rinaldo meant to welcome me with a black eye but this Canadian football fan will take the penalty kick to the face as an excellent memory from one of the best. What are the chances :). Wish I coulda kept the ball. Despite the physical pain of this moment, it ended up being the highlight of her trip, according to her Twitter feed (via Uproxx Sports).